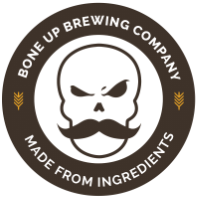 Stats: Death Salon - Bone Up Brewing Co. Cheese Pairing: Merry Goat Round. Best Occasion to Drink: Probably at the Death Salon? I mean, it's right there in the name. Brewers' Notes: This is apparently the Season of Unusual Collaborations around here, so when one of our more... unusual regulars* (hi Jo!) suggested we team up with the Death Salon folks, we jumped at the chance faster'n a jackalope can run a country mile, I tells ya. Anyway, after much deliberation, we decided on a nice 'n' tasty pale ale that leans toward the floral-forward side of things, and dang but it is tasty! Now, you might be thinking that we picked a pretty somber name** for such a light 'n' easy beer, but we've (sort of) got a perfectly good reason! See, the folks at Death Salon run a series of events along with their sister organization Order of the Good Death, who are dedicated to eliminating the collective cultural heebie-jeebies that we all have about death and dying. That might (as we've learned from experience) seem kind of weird and morbid, but we think it's pretty rad and also it's run by some pretty rad people so we made a beer for it! After much soul-searching and a modest amount of debate, we pretty much just said "funerals have flowers at them, let's make a hella floral pale ale!" And yeah, fine, it's a bit of a stretch. YOU try coming up with a tasty-sounding death themed beer (ideally without illegally foraging nightshade from a cemetery, Jake). ** Or not, depending on how well you know us.